Georgia has a long and rich tradition of wine drinking that goes far beyond merely enjoying a nice glass of red with one’s dinner this holiday season. New archaeological evidence and research suggests that wine drinking in Georgia may date as far back as prehistoric times and is an integral part of the development of Georgia’s rich culture and heritage. It would appear that wine has part of Georgian religious ritual and ceremony for centuries before the adoption of Christianity in 337 AD made Georgia one of the worlds first officially Christian countries, and has long been considered both sacred and central to family and everyday life. The presence of the Tamada, or toastmaster, is still often seen at gatherings and feasts and many families when moving home still preserve the old tradition of burying a jar of wine in the soil of their previous land to bless it. The attempts of the previous Soviet occupation to outlaw wine drinking in Georgia has been regarded by some social and political commentators as a direct attack on the Georgian cultural identity, so integral is the production and consumption of wine to the Georgian way of life. Even in creation myth dining rituals feature in the mythological heritage of Georgia. An old legend states that Georgia was created when the scraps of God’s heavenly feast fell from his supper table. The history of early civilization is very much the history of agriculture, specifically the cultivation of certain plants, and the land that became Georgia played a crucial role in this process, particularly in the cultivation of the vine. Linguists and etymologists speculate that the very word ‘wine’ – and its European counterparts including ‘wino’ and ‘vino’ – itself comes originally from the Georgian ‘Rvino’. 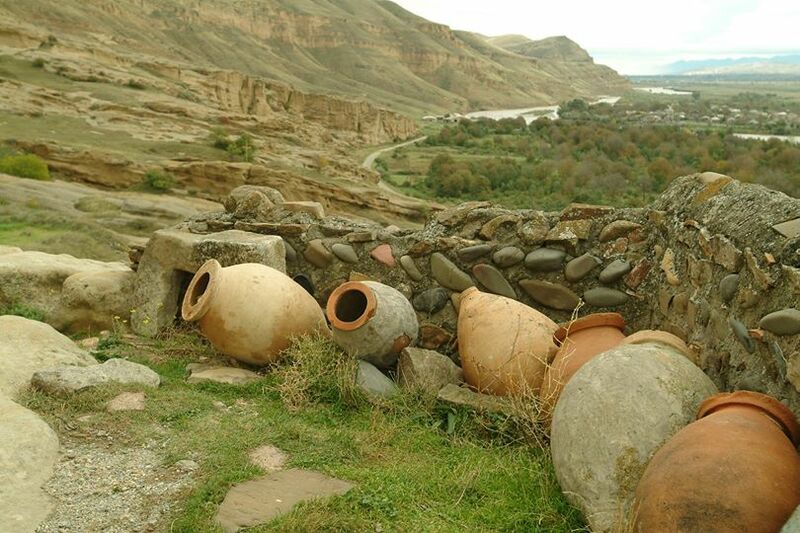 In a recent archaeological dig situated in the trans-Caucasus region of Georgia as we know it today, cultivated grape pips have been found dating back to the sixth to fourth millennium BC. 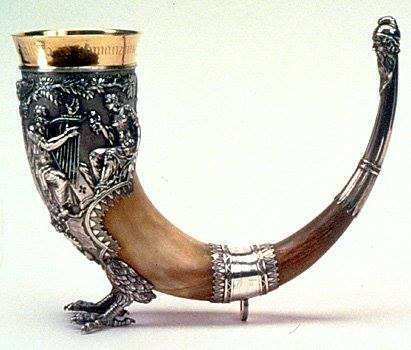 At other sites dated back to around the same period other artefacts that depict the early consumption of wine have been found, from a silver chalice shaped very much like a modern wine cup depicting what may be the ancient god Mithra drinking intoxicants, to a vessel decorated with wooden ‘grapes’ that has been found to contain wine residue. These artefacts date before evidence detailing the use of grapes as a food, suggesting that the vine was originally cultivated not for the direct consumption of its fruit, but for the express purpose of wine making. It has long been noted among researchers of global alcohol traditions that in countries where alcohol consumption is considered part of daily life and has entrenched ritual associations, alcohol problems are in fact a great deal less common than in those where ‘binge drinking’ is considered the norm. Those who drink alcohol in a more mindful manner, such as the way the Georgians and other cultures have traditionally consumed wine, tend to be more aware of their consumption and in the case of potential problems more able to carry out their own addiction self assessment. This may be considered a generalization, but from a sociological point of view there can be no denying that the responsible consumption of wine is often tied in to its being regarded as a healthy part of cultural heritage rather than a substance to over-indulge in. The long tradition of the Tamada, or toast master, is an excellent example of the Georgian attitude to wine drinking. The toast master is present at the supra, or special banquet or feast, and the roots of this role it has been discovered may go as far back as the first millennium BC. In another archaeological dig dating back over three thousand years a small bronze figurine holding a drinking horn was found amid other ritual artefacts. Experts believe the figurine shows a depiction of what may be the original Georgian Tamadas. 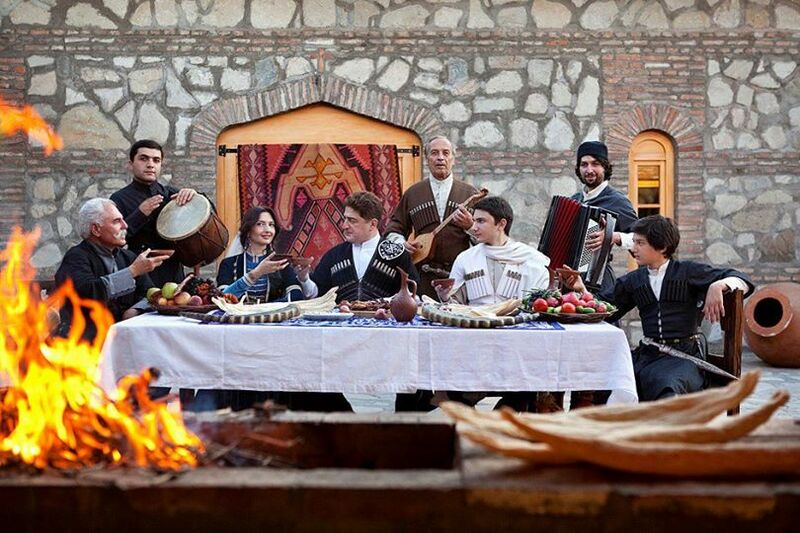 The beautiful country of Georgia, with it’s rich cultural and historical heritage, and the long tradition of wine drinking as both a sacred and a ritual act would appear then to go hand in hand, explaining why every year hundreds of tourists flock to Georgia, described by historians as the ‘birthplace of wine’. In anticipation of our trip to Georgia foe the International Wine and Tourism Conference in March, we have tasted 5 Georgian wines ranging from semi sweet white to dry red to sweet red. They were are clean and easy drinking and would seem to pair well with spicy foods. We attended a Supra in Tbilisi and there was no binge drinking. Everything was nicely controlled and our Tamada explained things. We did have several wines, but our group of Georgians and visitors drank in moderation. The wine enhanced the food as the food enhanced the wine. Our Tamada also led a group of three in polyphonic singing. Although we did not understand the language, we were able to enjoy the music and had a hint of the song’s meaning. If you are coming to the International Wine Tourism Conference, make plans to attend a Supra.